A match made in heaven. This tranquil fountain and our innovative lighting was featured in the entry garden at the recent Nashville Antiques and Garden show. We had a wonderful time participating in the Antiques and Gardens Show of Nashville this past weekend. Along with getting to meet and discuss outdoor lighting ideas with many homeowners who attended the show, we also teamed up with super talented Anne Daigh Landscape Architect, LLC. We were honored to help bring her featured garden, the entry garden, to life with the addition of our outdoor lighting, and even more elated to learn that the garden won first place in two categories at this year’s show as well! 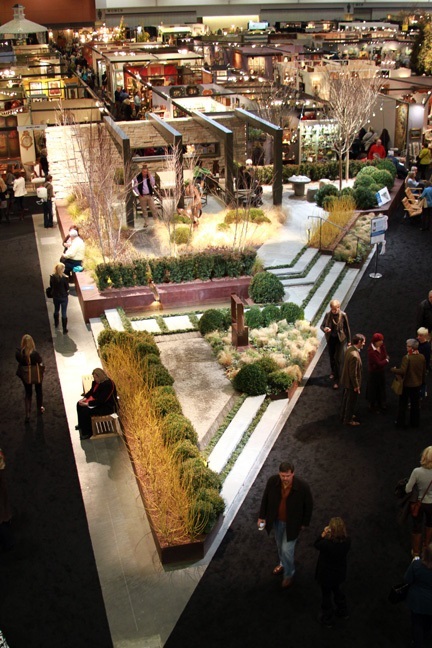 Overhead view of entry show garden at the Nashville Antiques and Garden show. The garden won both the Structure & Design Award, and the coveted Bryant Fleming Award for Best of Show. The Structure & Design Award is presented for the garden that best demonstrates the integration of horticulture and hardscape elements. The Bryant Fleming Award for Best of Show is presented for the Best of Show with respect to both horticulture and creativity. Nashville path lighting elegantly integrated into this award-winning show garden. We integrated a combination of our high-quality outdoor lighting fixtures into the entry garden including our new BB-02 path lights, and BB-02 deck lights. Both of these fixtures are some of our most popular, and exude a timeless, elegant design that blend seamlessly into the garden enhancing it with romantic washes of light. The lighting demonstrated not only the power of outdoor lighting within a landscape or garden setting, but how the two entities can mold together to become one in a true definition of artistic impression. Just like the philosophy behind Anne Daigh Landscape Architect, Outdoor Lighting Perspectives of Nashville also believes in being a storyteller. As the landscape design and individual plant selections outline the story, the outdoor lighting and other enhancements will help elaborate the story and bring it to life. 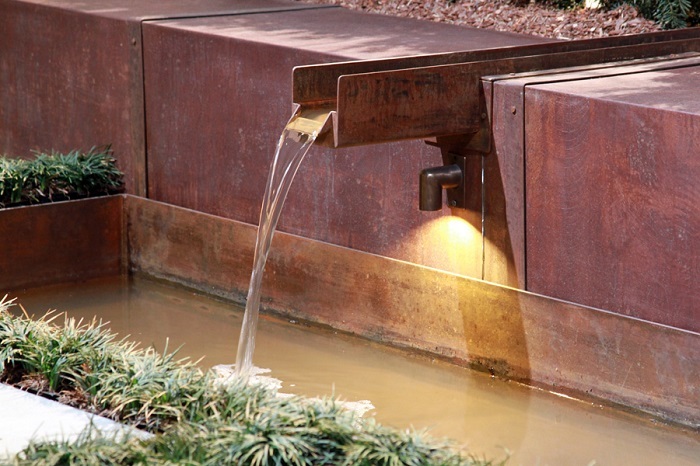 Up close look at Nashville path light used in Anne Daigh’s award-winning entry garden. The BB-02‘s versatile design allows landscape friendly installations in multiple landscape designs. 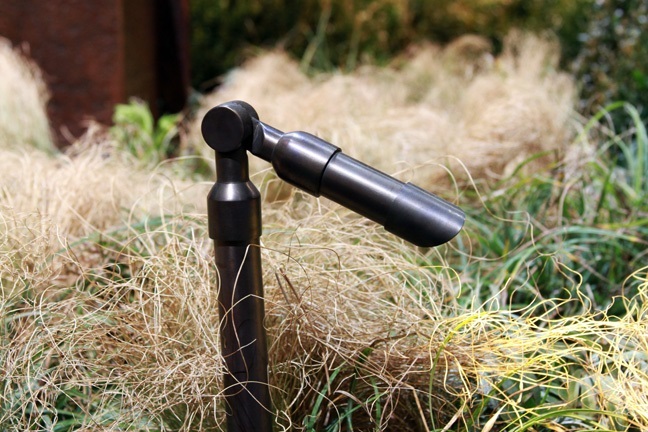 The BB-02 is available in different heights to work perfectly when placed in grasses. 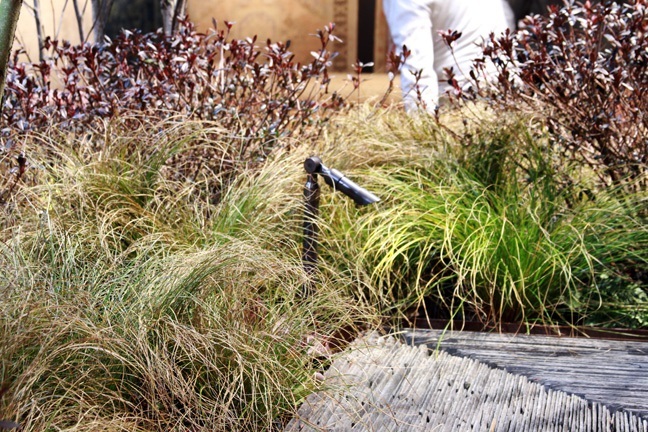 Some of the areas this light works best for include decorative ornamental grasses within the landscape, as well as other shrubs and plants and in outdoor spaces that have cumbersome dimensions to work with. 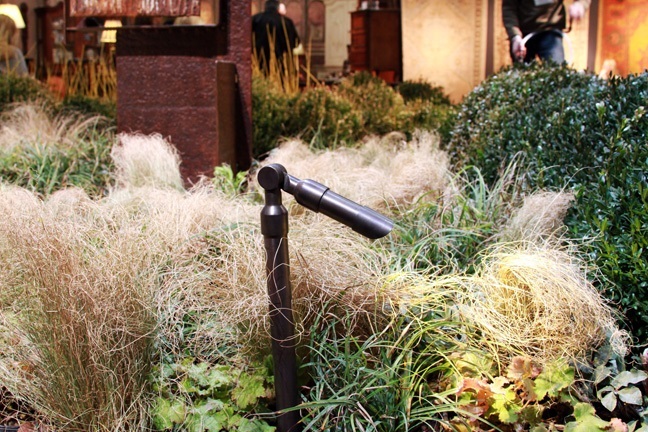 Paths lined with borders of variable height foliage and perennials will also benefit from the use of the BB-02. The list of areas this fixture is perfect for go on and on. The versatile BB-02 path light. Not only does the fixture look the part, it delivers a 30 degree beam spread which means this little light can go places no other light has gone before and illuminate those areas beautifully to boot. As with every quality fixture within the family of those used here at Outdoor Lighting Perspectives of Nashville, this light will make adding more beauty and definition to your professional outdoor lighting design a breeze. You can see more examples of the BB02 at work by visiting our landscape and garden lighting gallery located on our website. This entry was posted in Garden Lighting, The Romance of Outdoor Lighting, Trade Alliances, Trade Shows and tagged Anne Daigh Landscape Architect LLC, Antiques and Gardens Show of Nashville, architectural lighting, Garden lighting, Gardens, Landscape Design, Landscape Lighting, landscaping, lighting design, lighting specialist, Nashville directional lights, Nashville flood lights, Nashville fountain lighting, Nasville landscape lighting experts, outdoor lighting Nashville, outdoor lighting perspectives, Outdoor Lighting Perspectives of Nashville, Outdoor Lighting Perspectives of Nashville BB02 light, The Bryant Fleming Award for Best of Show, The Structure & Design Award by outdoorlightingnashville. Bookmark the permalink.